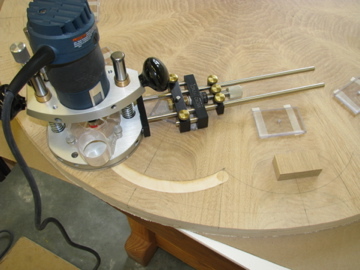 Plastic rectangles with pilot holes were temporarily attached to the surface of the veneered table with two-sided tape to provide pivot points for the Circle Jig. Dry-run set-ups determined where stop blocks would be placed (again with two-sided tape), to insure accurate starting and stopping points. 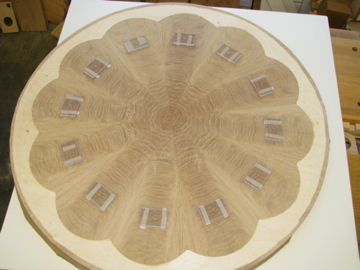 (Later the intersections were finished with a hand held chisel to remove the radius left by the router bit). 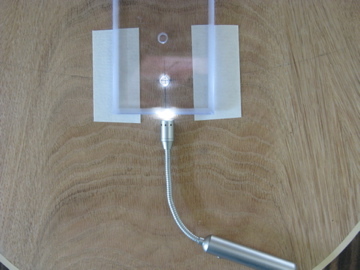 To insure accurate pivot point positioning Babbitt utilized one of the Plunge Base LED lights to shine horizontally through the plastic plate. 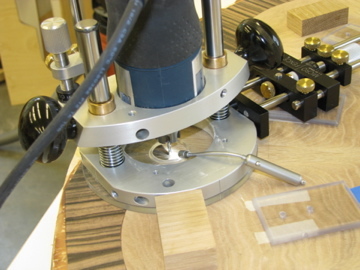 This refracted in the drilled pilot hole, assisting with alignment to the pencil drawn layout. 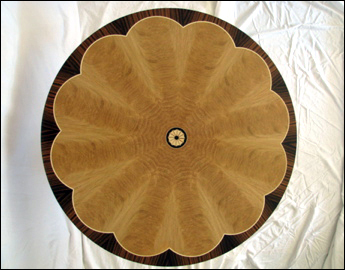 The outer Macassar Ebony veneer was cut using a band saw to conform to the scallops of the inner White Oak.Â Each of the twelve segments were glued up individually using yellow glue. 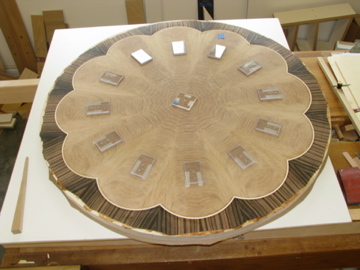 Scalloping completed and all outer veneer excavated using the Micro Fence Plunge Base. 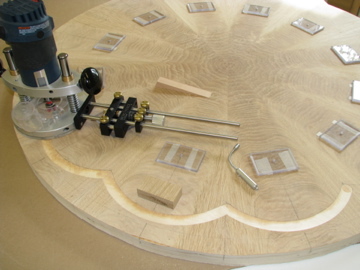 Babbit returned to the plastic pivot points to routÂ the 1/8” X 1/8” groove for the holly stringing using the Circle Jig & Plunge Base. 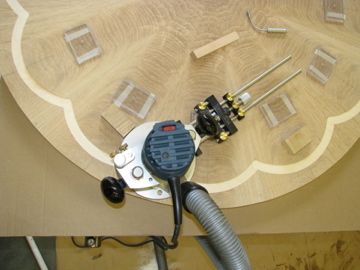 The stop blocks were once again positioned during a dry run (and illuminated with our LED light), to insure accurate cut stops in the actual cutting operation. 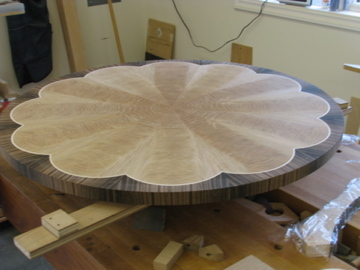 With the Ebony veneering completed, the final 30”diameter was cut from the central pivot position using the Circle Jig and a router fitted with a Â½” down spiral bit. 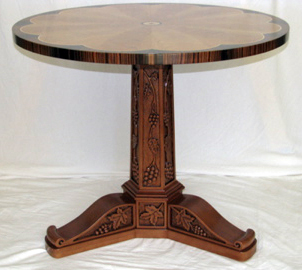 The final “waterfall” macassar ebony edge veneer was applied. 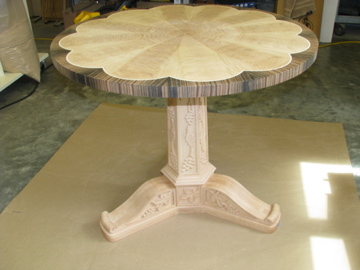 The table top prior to adding the center medallion and before finishing.